Since 2000 the Registry offers Mare Performance Tests for mares at a limited number of locations (see marked locations in our Inspection Tour Schedule). The Mare Performance Test is now called Sporthorse Performance Test (SPT) and also open for geldings. The mare owner and the registry will gain information about the skills and abilities of the mare to perform. The owner will get to know which talents and - may be - weaknesses the mare has. This information will help to select the right stallion for the mare. The successful completion of the Mare Performance Test with at least 70% is one option to receive the third star for performance of the ISR-Oldenburg Star Award System for Mares. If the mare passed the MPT with at least 70% and has presented at least one premium foal to ISR/OLD NA. For further details, check with the office. The scores and comments from the judges will give the owner and rider a fair evaluation about the strength and weaknesses of the horse, its future potential and the best training. The test certificate and the results (scores) will not only help owners and riders to get an evaluation far from barnblindness but may also help as a neutral validation when it comes to offer the horse for sale. All four year old or older mares and geldings which are registered with ISR/Oldenburg NA can participate in the Mare Performance Test / Sporthorse Performance Test. 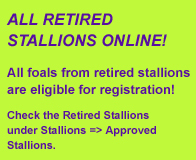 Also all mares that are in one of the ISR/OLdenburg NA Mare Books are eligible. Mares should have been presented and approved for Mare Book entry before. The Mare Performance Test is NOT the evaluation process for Mare Book entry. The Mare Performance Test / Sporthorse Performance Test is an one-day event. At first the basic gaits (at free schooling) and the free jumping will be scored by the judge. At the free jumping, the judge evaluates the jumping ability, style and technique. Mares and geldings should be schooled to freejump several times prior to the test. This is followed by the under saddle presentation. The judge will evaluate the basic gaits again and the rideability. Mares and geldings should be able to lengthen strides in each gait and to perform simple dressage movements such as a three loop serpentine and free walk on a loose rein. The under saddle test is not a dressage test. However the mare or gelding should be able to walk, trot and canter up to 15 minutes. The horses should be presented well balanced and ridden forward. Up to two horses are allowed to be in the arena at the same time. The riders will follow the judge's instructions when presenting the horses in the three basic gaits. Mares and geldings must be enrolled at least four weeks prior to the inspection. Retrieve the enrollment form ( PDF ) and send it in. Enrollment is mandatory! 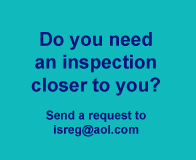 Only horses that have been enrolled four weeks prior to the inspection are permitted to participate.